After the election of Donald Trump by the electoral votes of "red" states, I resolved to challenge my feelings of otherness and animosity towards those states by visiting as many of them as I can while Trump is in office and making paintings about my experiences there. My primary goals for this project are to make contact with red states (specifically the people and landscapes they contain) and to make paintings. From January 2017 - January 2021, I am taking short trips to several red states each year. While there, I meet people, take pictures, and make notes and drawings. Then I come back to my studio in Seattle and make a group of paintings based on my experiences. In each state I visit, I am asking people who live there where they think I should go in their state. I ask them to choose a place that they think is important in some way - which I have left open to their interpretation and have included such places as the Grand Canyon, a haunted restaurant, the projects, and city parks. When I go to the places people tell me to go, I'm thinking about those people and their stories. I'm also having my own experience in the place. All make their way into the paintings, sometimes in an abstract, minimal way, sometimes in a more recognizable way. With this project, I am not attempting to summarize or represent each state. I am not a self-appointed ambassador from a blue state. I am not trying to have the quintessential experience of each state. I’m not observing from a distance. I am having an experience in each state, as myself: a white, queer, female artist from Seattle. As a painter who often bases projects on a sense of place, I know that I end up feeling connected to the places I paint. I’m using this project as an opportunity to interact with people I normally wouldn’t have the excuse to meet. I’m using painting as a way to insert myself into places where I’m not sure I belong. The resulting paintings are usually landscape-based and somewhat abstract, with a personal narrative running underneath. My goal for the paintings is for them to communicate something about the place they represent, so that the person experiencing the painting ends up feeling connected to the place in some way they weren’t before. I also hope they feel licked by painting. You can read my experiences in each state in my red country trip diary, here. 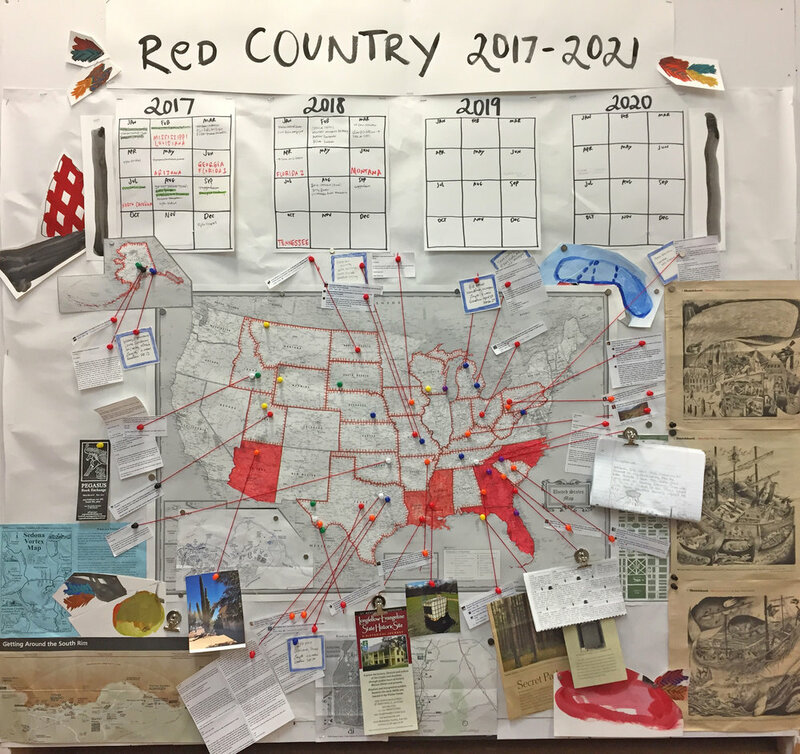 FAQ: If you want true "Red Country" [insert name of red state], I suggest you locate an AirB&B or something in the [insert part of red state] region. Our area of [insert name of red state] is one of the rare bluish areas of the state. A: I appreciate the thoughtfulness of your comment and your suggestion. But/and, the project is inspired by the artificial divide created by the electoral college. If I wanted to go to a red state I could drive 45 minutes in any direction (from Seattle). But according to the electoral college, which is responsible for the socio-political narrative of our country right now, as it is the force that made DT president, the redness and blueness is along state lines. So, anywhere in any red state counts! FAQ: Can you really experience a state in just a few days? A: No. I’m not trying to experience all that a state has to offer. My goal is just to have my own experiences in the state. If I got the flu in a red state and spent my entire time on the couch, that would still count as my experience in that state. FAQ: How/why do you think you have a right to represent a place you’re not from? A: It’s great that you’re starting to think about identity politics and where they might be applied. That is an essential part of any undergrad (or grad) art program and I clap for your teachers. I absolutely do not have a right to represent a place I’m not from, and I am not trying to do that. My goal is only to have my own experiences in a place I’m not from and to make paintings about it. FAQ: This project seems really political but your paintings don’t look political at all to me. They just look like weird abstract landscape paintings. A: What does the weird mean when you look at it? What information is recognizable? What seems obscured or missing? Are the colors natural/representational or are they kissy melty or are they off-putting? What could that mean? How much meaning can be generated just by looking and wondering? How does knowing the concept behind the project inform your visual-sensory experience? Do concept and painting need to be separate? Why? Is it a political act to let a landscape lick you? I think so.